*If you want the Digital Download edition of this set, please click here. 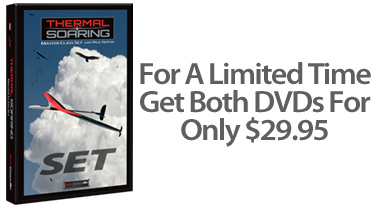 For a limited time, get both DVD editions of our new Thermal Soaring Master Class video training programs at the special price of only $29.95. Both of these highly detailed video programs will teach you all about advanced thermal meteorology, air reading, thermal prediction, tuning and flying techniques. You get 4 hours of professional training all shot and mastered in beautiful High Definition video. For more information on the Thermal Soaring Master Class taught by thermal pro Paul Naton, click here. For more information on the Thermal Soaring Master Class#2 video, click here. With our 30 day money back guarantee, you can invest in this terrific DVDs risk-free. If you don't learn a ton of valuable flying techniques, I'll refund your purchase price, no questions asked. Estimated shipping: US First Class: $4.00 - US Priority Mail: $7.75 - Int AirMail: $13.50, also calculated at check out. Just add this discounted DVD set to your cart and check out, or give me a call on our toll free line, 888-834-2261, M-F, 10am-5pm EST, and I will be happy to take your order information or answer questions. You can use any major credit card or Paypal for your purchases. Click the button below to add the Thermal Soaring Master Class DVD Set to your wish list.